Haas driver Romain Grosjean has been handed a three-place grid penalty at the Monaco Grand Prix. He caused a three-car pile-up on the first lap of Sunday's Spanish GP, taking out Renault's Nico Hulkenberg and Toro Rosso's Pierre Gasly. The penalty was awarded after Grosjean told race stewards he had chosen to allow his car to cross the track. They took into account that his car was already almost fully off the track on the outside when he made his choice. Hulkenberg was critical of Grosjean's driving and made a reference to his reputation for having numerous spins and off-track incidents. "He spun and came back into the track," the German said. "I couldn't go anywhere, couldn't avoid him and he took the back end of my car, there was nothing I could do. I couldn't avoid him, unfortunately. 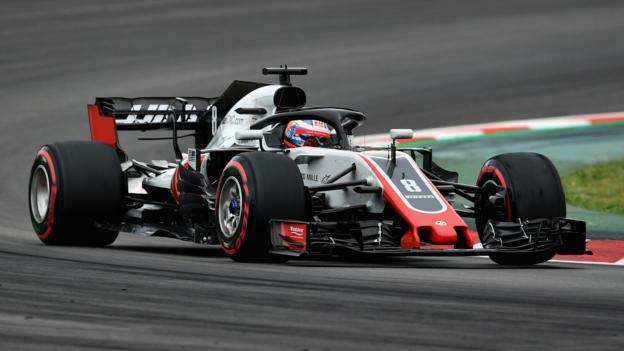 "He (Grosjean) didn't look great in that scenario, generally he likes spinning, but on the first lap is not a good time to do it with everyone there. He has to look at it and do some work on himself." The stewards' verdict said: "The driver stated that he made the decision to cross the track, trying to avoid the other cars and that he felt this was his best option. "The stewards found that while it is speculation as to where the driver's car would have ended up had he chosen other alternatives, it is certain that while crossing the track in front of the following pack of cars, which he chose to do, that a collision occurred. "Further, in reviewing the video, the Stewards found that the car was following the line on the left side of the track and was almost fully off the track, when he made the decision to cross it." Grosjean, who at the last race in Azerbaijan crashed his car while driving under safety car conditions, was also given two penalty points on his licence, giving him a total of five in the last 12 months. If a driver earns 12 in a year, he serves an automatic race ban.